Some years, the number one movie decision is easy. Last year, 50/50 was the top movie. Period. End of story. Other year, I go back and forth between two or more movies. This is one of those years. My number one and two movies could have switched places had my mood been different when I created the list. So know that The Intouchables could very well be the best movie of the year. The story itself is fairly recognizable. Paralyzed man gets an unconventional assistant, and they end up changing each others' lives. And honestly, you could probably tell much of the story before seeing it. This isn't a "guess what's going to happen next" type of movie. 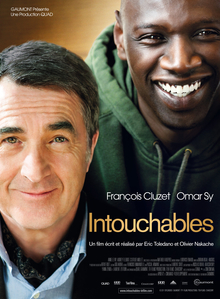 But The Intouchables avoids the cliches that you're expecting. The story isn't exactly what you're expecting. Most importantly, neither character is who you think they are. I like movies with good characters. Both of these characters are unique and have their own story to tell. Put together, they create an amazing dynamic. Perhaps best of all is this: The Intouchables is a true story of a quadriplegic. I said earlier that you can probably figure out the basic story. The tone, however, is not what you're expecting. Movies involving illnesses or handicaps usually have a heavy weight to them. While good, they can be a bit of a bummer. Watching, you'll cry every now and again. But the pure sensation of fun will outnumber the tears. I challenge you to dislike this.I challenge you to then find someone who wouldn't like it. You'll lose. Unlike my number one movie, The Intouchables is for everybody.